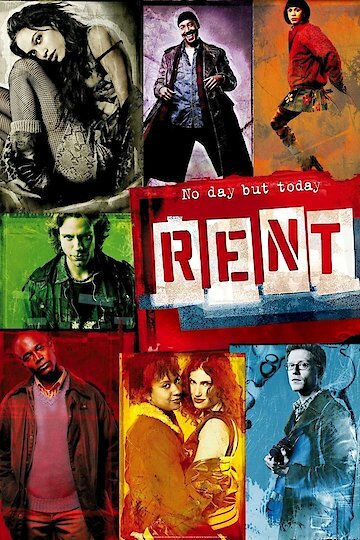 Based on a Broadway musical, Rent is directed by Chris Columbus with a screenplay by Stephen Chbosky. Starring much of its original stage cast, Rent follows a group of young adults struggling with life in New York City in the last year of the eighties. On Christmas Eve the tenants of a building in a destitute neighborhood learn that they're meant to pay rent which had previously been forgiven by the building's owner and an old friend of two of the residents Mark Cohen and Roger Davis, played by Anthony Rapp and Adam Pascal. The failing filmmaker and HIV-positive songwriter refuse to do so and another of their old friends, Tom Collins portrayed by Jesse L. Martin, arrives with Angel played by Wilson Jermaine Heredia, a drag queen who rescued Tom after a mugging. The building owner Benny, played by Taye Diggs, says they can stay rent free if they stop another of their friends and Mark's ex-girlfriend Maureen, played by Idina Menzel, from doing a protest over a business Benny plans to put in the neighborhood but they refuse the offer. Meanwhile, Roger meets HIV-positive drug addict Mimi who is interested but Roger pushes her away, struggling with his own HIV-positive diagnosis. There is a riot following Maureen's protest which Mark films and sells to a news agency. During a celebration after the protest Roger learns of Mimi's condition and the pair begin a relationship. Over the next year the group begins to crumble as Joanne and her girlfriend break up, Mimi continues drug use and Mark feels like a sell out with his job at the news agency. Angel passes away near Halloween and they all squabble at the funeral. Roger sells his guitar and moves out west and Mark quits his job focus on his own projects. Roger comes back to New York to tell Mimi he loves her and play the song he was finally able to write dedicated to her. Rent is currently available to watch and stream, download, buy on demand at Showtime, Amazon, Vudu, Google Play, iTunes, YouTube VOD online.